Success as a songwriter didn’t fulfil Niles Hollowell‑Dhar, so he reinvented himself as KSHMR to conquer the world of EDM. 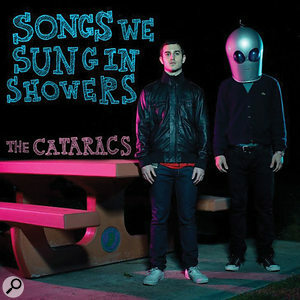 Singer‑Vine left the Cataracs in 2012, and Dhar carried on under the name on his own for a while. During this time, ‘catching his stride’ translated into some substantial success, for example co‑writing and (co‑) producing two songs on Selena Gomez’s US number one debut album Star Dance, including the single ‘Slow Down’, and co‑writing and producing a couple of tracks on the deluxe version of Thicke’s Blurred Lines. Dhar also co‑wrote tracks with Sean Paul, Enrique Iglesias, Santana, Jason Derulo, Tinie Tempah and Jessie J.
Niles Hollowell‑Dhar released his first single under the KSHMR moniker in 2014. ‘Megalodon’ was soon followed by several others, including his biggest hit to date, ‘Secrets’, a collaboration with Dutch DJ‑legend Tiësto and Australian singer Vassy. The latter song was released in 2015, KSHMR’s breakthrough year in the EDM world. 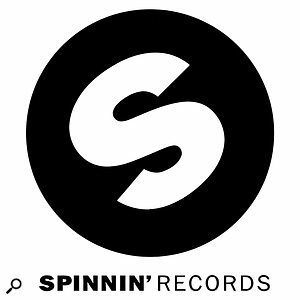 Since then, another 25 KSHMR singles have been released, mostly on the Dutch Spinnin’ label, and some of them in collaboration with other famous EDM artists such as Hardwell and R3hab. 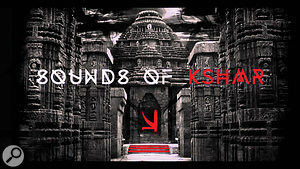 There also have been another 15 free‑download KSHMR songs. The large amount of single releases, and the fact that few register in the pop charts, is typical of the EDM world, which has tended to inhabit a bit of a universe of its own. EDM acts tend to rely on streaming sites like YouTube and Beatport, and on live DJ performances; KSHMR made his first big live splash at the Ultra Music Festival in Miami in 2015. 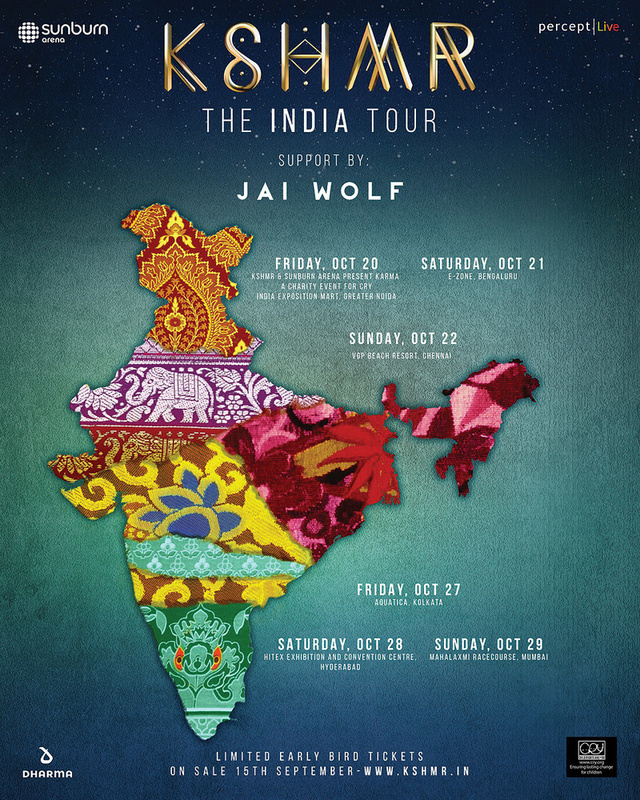 KSHMR’s use of instruments and sounds that reflect his Indian heritage have helped him become hugely popular in that country.As KSHMR, it took Dhar less than a year to establish himself as one of the biggest stars of the EDM scene. 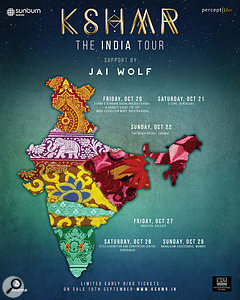 In addition to his many single releases, there have to date been three KSHMR album releases, including The Lion Across The Field (which was accompanied by a children’s book written by Dhar), a couple of dozen remixes, and two KSHMR sample‑pack releases on cloud sample site Splice.com, with a third sample pack coming up later this year. Dhar launched Dharma Worldwide in 2016 as a sub‑label of Spinnin’, and during the second half of 2018 he will be releasing one track a month. 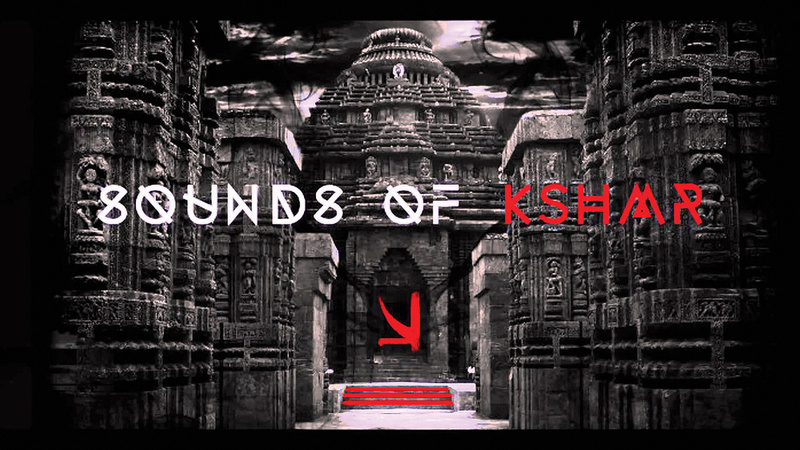 Not all KSHMR tracks feature Indian elements, but they have nevertheless become a significant part of his artist identity, which also has led to great popularity in India. Dhar explains: “When I came into the dance music scene, it was very European, and a bit homogenous in the sense that it was all really uplifting music. Avicii was everywhere, and he was an idol of mine, but at the same time I saw that there would be space for somebody to bring a sound that was a little darker, that would touch people on a different level, and also to work with influences from different cultures. That’s where my Indian background came in. “It’s interesting, because when I grew up there was nothing super‑cool about having an Indian background. My dad had a kind of funny accent and there were not many recognisable Indian people in the US. All we had was Apu Nahasapeemapetilon, a kind of goofy character from The Simpsons. But as I got older I started to appreciate that there was something unique about my background, and that’s why I decided to put that influence into my music. 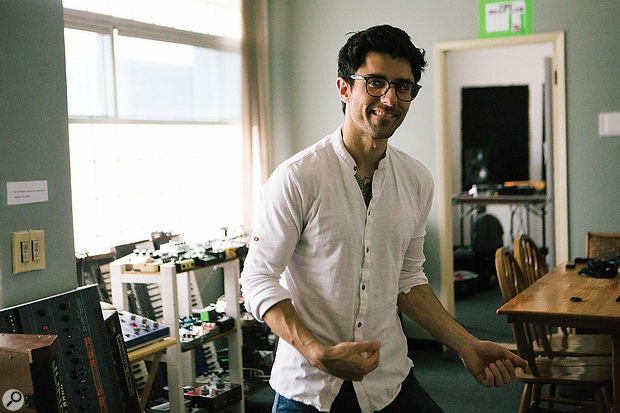 Dhar’s studio is a typical 21st Century affair, located in his bedroom in his house in Studio City in Los Angeles, with an in‑the‑box setup. His current gear there consists of an Apple MacBook Pro (“newest model with maxed‑out specs”) running Ableton Live, with a UA Apollo 8p interface, ADAM S3H monitors, PreSonus Monitor Station v2 monitor controller, Native Instruments Komplete Kontrol keyboard, RND Portico II mic preamp and a Neumann U87 mic. Although he’s an Ableton Live user, Niles Hollowell‑Dhar does not use the program when DJ’ing, preferring instead to cue tracks up on a conventional CDJ‑style playback system. As a writer, Dhar can find inspiration in a variety of sources. “I will sometimes jam on the piano. People tend to say that if a song sounds good on just a piano, it’s a good song, but you tend to find yourself writing ballads on the piano, so I also like to find interesting sounds as starting points. I am always collecting Kontakt libraries, it’s like an obsession! I might start there and find an instrument or sound that has an interesting character. Sometimes the character of a sound will lead you to a melody that a very linear instrument like the piano might not. “Aside from Splice, my sampled instrument sounds mainly come from Kontakt, plus EastWest’s Play, which has incredible string and ethnic music libraries, and MOTU’s UVI Workstation, as well as Best Service’s Engine. Best Service puts out many libraries with weird and cool stuff. Because I am always looking for string sounds, I tend to look for more obscure string samples. With regards to synths, I use Sylenth, Reveal Sound’s Spire, reFX’s Nexus for leads, and Xfer Records’ Serum, which has a distinct character that I tend to use for bass sounds. I also love Spectrasonics’ Omnisphere, which has many sounds, and although they are not all great, they always are fun. KSHMR’s record label Spinnin’ has been an invaluable source of contacts and collaborations.To illustrate his writing process, Dhar elaborates on a couple of examples, detailing the makings of his big hit ‘Secrets’ and a song released in the middle of 2018, ‘Carry Me Home’, with Dutch singer Jake Reese. “I had a day working with Vassy,” recalls Dhar, “and she sang me this vocal and lyric idea, ‘Oh won’t you stay for a while / I’ll take you on a ride / If you can keep a secret.’ There was more, but I edited her vocal to loop this line. After we recorded that, I must have tried for a year to add other things, because I knew the vocal was excellent. I had this melody that I thought was great, and in the end Jorn Heringa from Spinnin’ suggested a synth sound for it. He then played the track to Tiësto, who contacted me and suggested some changes. After Tiësto got involved I worked really hard to make it absolutely perfect. With this song it took a year from when the vocals were written to the time it came out. Many producers build up large backlogs of unused and/or unfinished tracks that build up over time. Dhar is no different, but he has a few unusual tricks up his sleeve in dealing with this challenge. “I save all different versions of my sessions, not only as projects, but I also save stereo bounces, because you may never go back to a project, or to an earlier version of it, and you’re much more likely to play a stereo bounce. Another thing I often do is that after I have developed a full track with different sections, I separate all the different sections in different projects, so a drop will have its own project, and so will the break, and so on. Sometimes even the first and second drop or break will each have their own projects. With six single releases this year, and a new sample pack full of recordings of live musicians coming up, Dhar is on a roll with his mission to humanise in‑the‑box music making. His ethos no doubt sounds like music to older generations of music makers and even to millennials, and will hopefully also give Generation Z musicians a helpful reminder of the roots of what they’re doing, and what it’s all about. 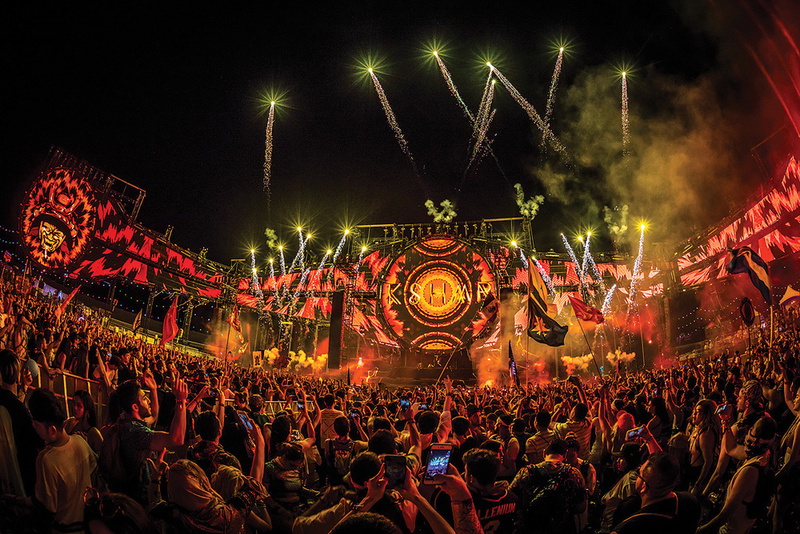 Electronic dance music tends to rely extensively on the use of samples, but because Indian music isn’t mainstream in the West, good Indian instrument samples are hard to find. Niles Hollowell‑Dhar therefore included many Indian sounds in his second sample pack on the cloud‑based sample library Splice, Sounds Of KSHMR 2, which was released in 2016; like his first, released the year before, it has proved extremely popular. His third sample pack for Splice is slated for release later this year. Sounds Of KSHMR sample pack, available on the Splice platform.“I use Splice all the time,” elaborates Dhar. “In fact, I am a partner with them, and have some kind of official title as a consultant, or something. Mostly I just lend them my ideas. I was the very first to do a sample pack for them as an artist. When I create the sample packs I go through my own sessions and basically sample myself, and the truth is that I often use my own Volume 1 and Volume 2 sample packs myself! For Volume 2 I played many of the Indian melodies with Kontakt instruments, but for Volume 3 I recorded many Indian instruments at a studio in Burbank. “I had made a wish list of instruments from around the world that I love, and my managers helped me find musicians who could play them. The recording chains I used depended on the instruments, but I like to use UAD plug‑ins in ‘record’ mode, printing some EQ and compression to save you time later. Using Indian instruments, and in fact most ‘real’ instruments, in EDM tracks is challenging because in order to have them match the heft of the synths and drums, some thorough smashing and sculpting is required: saturation, compression, limiting, multiband compression, transient design. It is also very important to quantise the audio by chopping it and aligning notes to the grid. That’s just how it is when you combine elements recorded into a microphone and others that are synthesized. EDM productions often make heavy use of ‘ear candy’ such as risers, drops, hooks and so on, so it’s noticeable that KSHMR employs risers very sparingly, particularly in tracks with vocals.